Candidate must have strong oral and written communications skills. I think it is fair to say that writing is taught and tested in school but what about oral presentation skills? 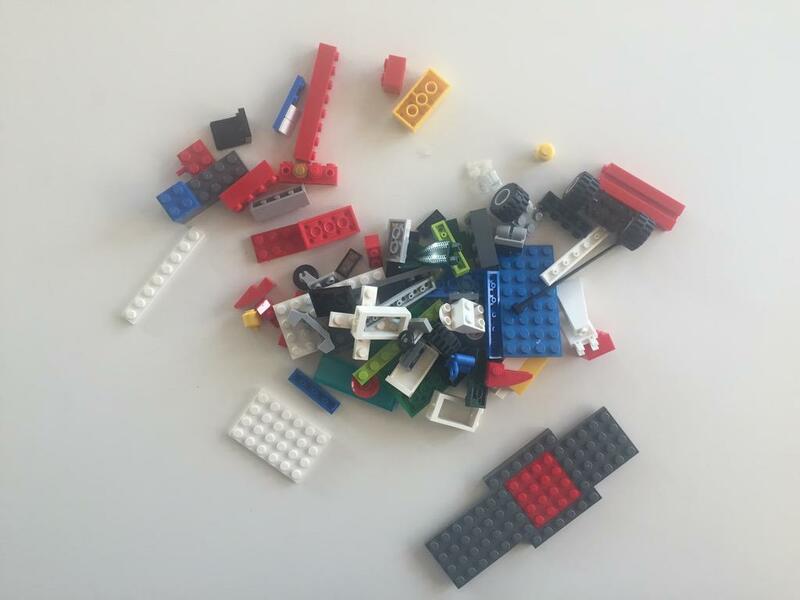 In many schools, I feel like kids are expected to kinda pick it up on their own. But many folks never do and struggle with it throughout their adult lives. 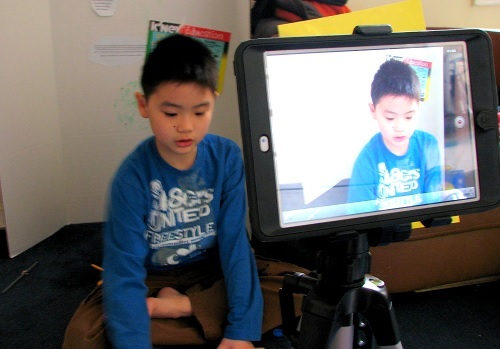 Any kid-friendly teleprompters out there? Hopefully, our schools will start teaching things like rhetoric some day but in the meantime, I found an awesome way to help our kids help themselves in this area. I spent years helping camera shy medical school professors talk about their work on broadcast t.v. interviews. It's wasn't easy but practice always made things better and what worked best was watching oneself after taping. When you do it yourself, you feel empowered. You have more vested in your project. So when my kid entered his school's science fair, I knew that he would have to do some explaining. Last year, he had a tough time describing to the judges what his project was about. I remember Number 5's mom telling me that her daughter found this difficult too. Thus, this year, I decided that he should tape himself. The video playback will give him the feedback he needs to sharpen his message and the repetition will also help him to memorize his words. This method helped the brilliant research scientists with whom I worked, but could it help a nine-year old? I had to seek out some experts. Who could be more perfect to help me help kids learn how to be Camera Ready and present their best selves? 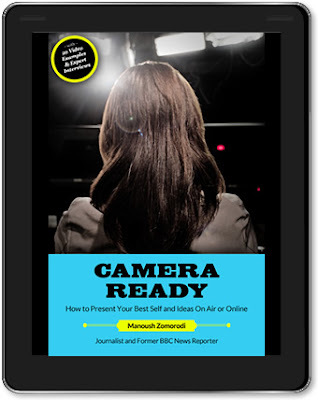 Manoush Zomorodi, author of Camera Ready and Host of WNYC's New Tech City liked what I was doing for my son and graciously gave me some tips to share with our children! Kids, listen up! Think about what you'll say before you start. Think of it like a story. What is the beginning, middle, and end? Make sure the camera is at eye level with you. On the screen, your eyes should be in the top third and there should be a little bit of space between the top of your head and the top of the screen. Don't worry if you think you sound weird or you look weird. Everybody thinks that - even grown-ups! I learned this trick from network cameramen. If you want the speaker to look somewhere, give them something to look at! I think this will help kids follow Manoush's tip too. 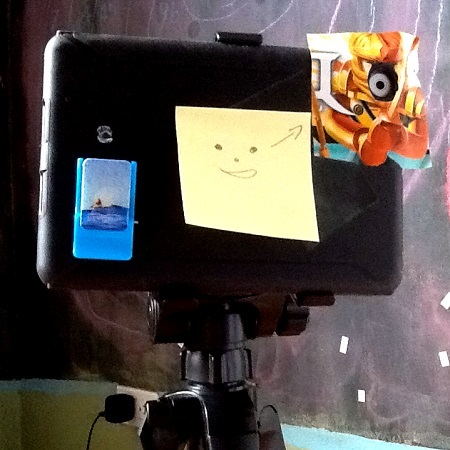 Get at eye level with the camera! Manoush also gave me more reasons why this exercise could be helpful. "Between Skype and Facetime and YouTube and webcasting, I don’t think you’re going to have meetings where you don’t see each other," said Manoush. "When they’re grown-ups, the meetings are going to be in video. They’ll be talking to their parents in video all the time. A lot of people already are." Gosh, what Manoush said really stuck on me. Video is a huge part of our present but how much it will be part of our future everyday lives is really unimagineable. 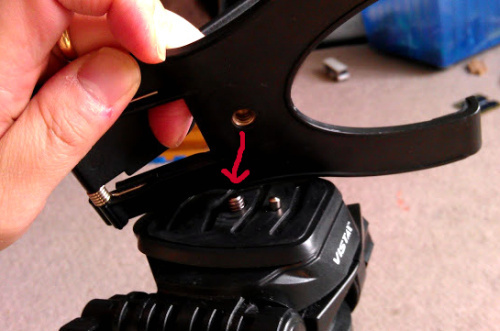 That said, it is one of the reasons why I love the Vista Explorer Tripod. 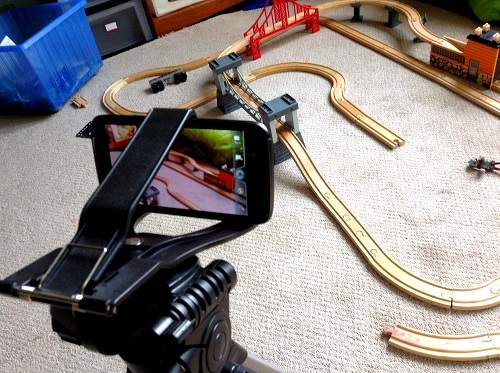 It is so lightweight and so easy to use, getting them to make a video for school or for fun will never have to be a big production. 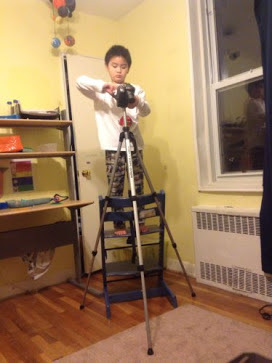 I dare say, stabilizing the camera on a tripod (versus a shelf, sitting on top of books, being held my your little brother) is going to be a lot safer for the camera. It was good? What about it was good? I was lucky enough to pick the brain of Nancy Friedman, co-Founder and Queen Bee at KidzVuz, a video review and sharing site for kids ages 7-12. She knows all about what happens when kids tape themselves. Nancy explained often kids' opinions are so limited ie. "I don't know," "Yeah, I thought it was good." However, when kids tape themselves, something interesting happens. 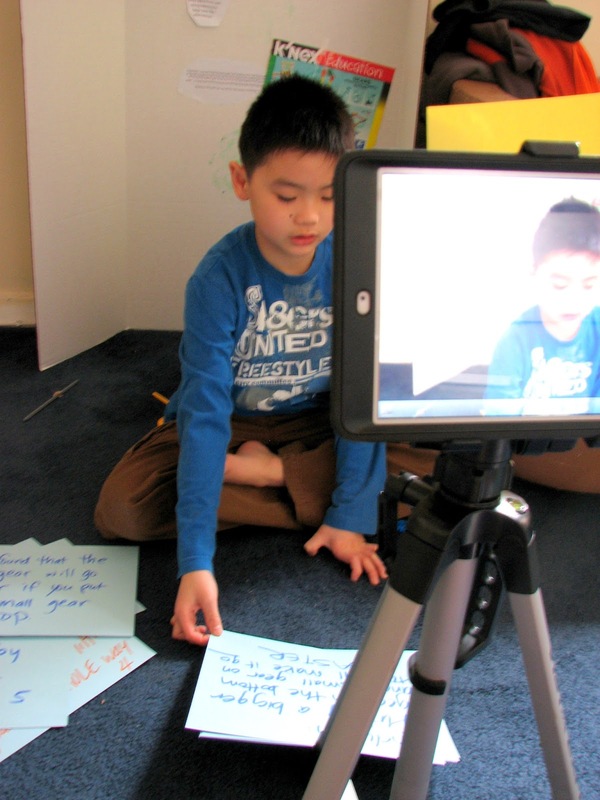 "It really helps kids learn how to make comments and formulate opinions," Nancy said. Nancy is even receiving feedback from teachers who use KidzVuz to help students improve on their WRITING SKILLS! How cool is that? The more they can do on their own, the better it is for BOTH of us. I don't want every educational thing in the house to be something that has to be supervised by me. So I got the Case Star Universal Clip Holder that is supposed to fit with just about any tablet (but we've only tried the iPad, iPad mini, and an HTC Smartphone- all worked just fine). 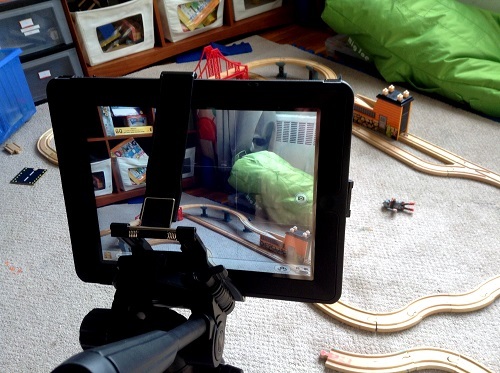 The kids prefer to use their iPads when filming themselves. (There are a million functions on my digital camera) Playback is so much better on a bigger screen too. They can film a little, watch it, and see if they need to adjust where they are sitting or how they are talking. etc..
Easy to screw on and off! Holds this big old iPad that is covered with an Otterbox, a very strong iPad cover that I love! The Verdict? How Did He Do? So how did he do after practicing a few times? Last week, I had the pleasure of watching him explain to other children what his project was about. He had found a great motor* to put on his K'nex gears experiment turning a crank fan (as shown in the K'nex set) into an electric fan. 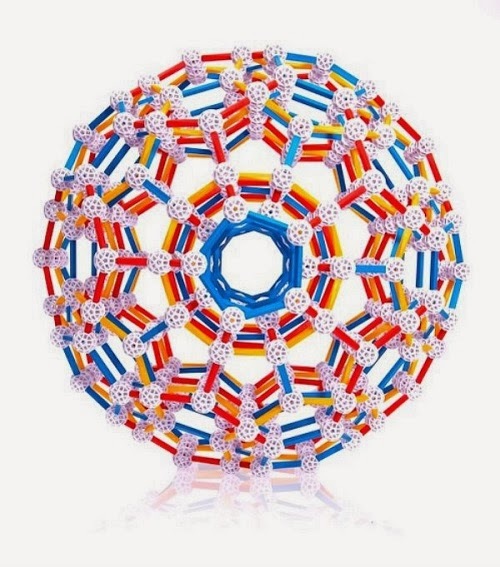 It was quite attractive since K'nex is very colorful and the fan was constantly spinning. Many kids and teachers stopped to talk to him. I think he was happy with himself for having practiced using his triple threat! I hope he continues to use this combo as long as he needs to... maybe even after college? I don't recall any classes that taught presentation skills in college either... at least that was what it was like when dinosaurs like me went to college. Hope times have changed! I saw a lot of confidence that day. Thank you Davis and Sanford for making an awesome tripod. And thank you K'nex for your amazing Gears Education Set!!!! 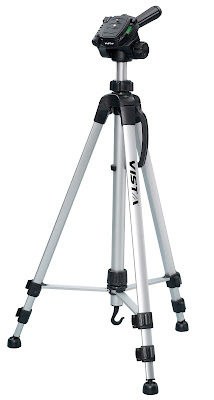 And now here's your chance to win your very own Vista Explorer Lightweight Tripod! How cool is this??? Just fill out the Rafflecopter form below! And please take a minute to drop by Tiffen's FB page. There are so many cool pictures- you kind of get this dreamy feeling that the world is beautiful and just waiting to be photographed by you! It's inspiring. I have to check out the teleprompter! Do I need one? Probably not... but you never know... I think it has educational and possibly therapeutic value, don't you????? Want to buy on Amazon right now? Use my link to support Toys are Tools. Here are the links to many of the products discussed here. *The K'nexosaurus kit includes the motor that we liked. 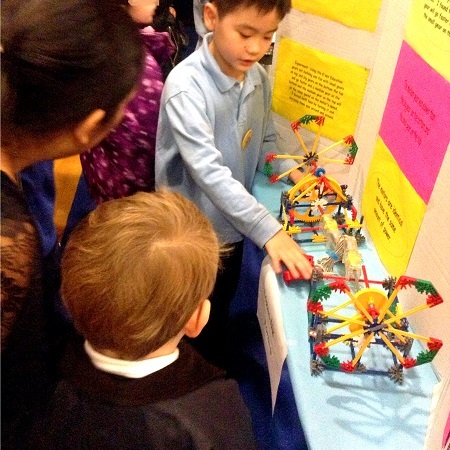 The K'nex Gears Education set is not meant to be used with a motor but Number 1 modified his fans to use with motors in order to demonstrate that his fans were running on the same power. This helped to show how different gears create different speeds despite running on the same power level. Disclosure: Toys are Tools was not compensated by the manufacturer for the publication of this review. The Triple Threat items were purchased by yours truly. 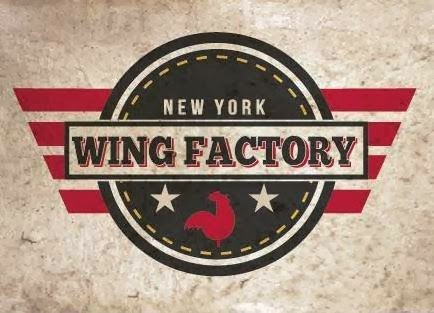 The giveaway prize is being donated by the manufacturer. Thank you Tiffen! Hey, I have that train set in the picture. Picked it up post Christmas and it was 75% off. What a great tool to add to the arsenal. 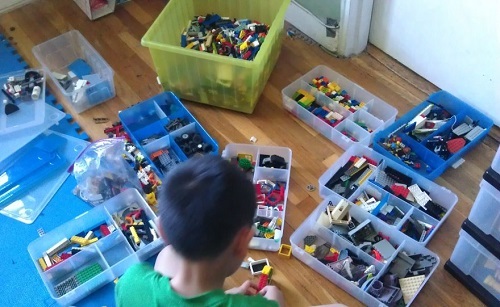 My son likes to make stop-motion Lego videos. A tripod would be very helpful with that. Great review. I don't know why I hadn't thought of using our iPad. We will definitely look into getting the Case Star Universal Clip Holder. Also, filming my son might help him with his shyness. It's worth a try. What a great gift idea for my kid. He's going to be so surprised that I bought this for him. I never thought about the clip holder. Have you ever used a gorilla pod?